100% privacy, quiet and a private swimming pool. These are important aspects that describe this holiday home. It is situated in the woody area of Pontcirq (2 km). The premises are 1.4 hectares and surrounding the house is a beautiful garden with shade trees. The children will be able to enjoy themselves in the fenced-in swimming pool, while you start a new book on one of the loungers. In an elevated part of the garden there's a partly covered terrace with outdoor furniture and a barbecue. Perfect for enjoying a meal at night! The interior is very neat and tidy. The owner has made free Wi-Fi available! 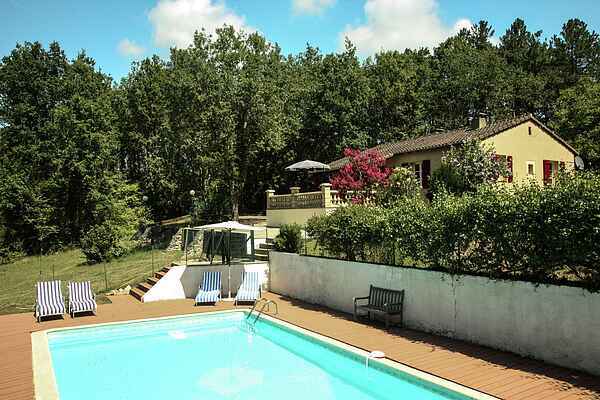 The house is in between top locations such as Cahors (25 km) and Fumel (33 km). Make a trip across the Lot to Cahors with its charming centre en fortified medieval bridge, the Pont Valentré. 28 km further down you will arrive in the enchanting town of St. Cirq-Lapopie. Follow the river in the other direction and you will end up in charming Fumel. 6 km land inwards you can visit the spectacular medieval Château de Bonaguil. A sportive trip in a canoe is also a good option! Canoes and sail boats can be rented in Puy-l'Evêque (19 km), for instance.